Telepresence robots aren’t exactly a new technology – they’ve been performing tasks for their human counterparts for plenty of years already. But until now, the best level of interaction that could be expected was a two-way video feed with audio from one or both sides. A new telepresence robot developed by researchers at Keio University would give the user the benefit of transmitting three senses, even when the human user is miles away. The bot is called Telesar V, and it features systems that allow the user to feel like he or she is really there in the place of the robot – just like in the movie Surrogates. A head-mounted 3D display lets the user see what the robot sees, and an associated audio system streams sound to the wearer. But maybe the most impressive part of the system is the tactile gloves that allow the user to feel everything that the robot feels. The tactile system is sensitive enough to feel the uneven bumps on a LEGO brick. 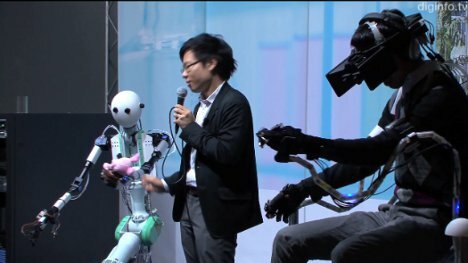 The user can connect to the robot from far away and manipulate it remotely, relying on the built-in technologies to feel like he or she is really there. It’s only a matter of time before we all have one of these and can modify their appearances to look exactly how we’ve always wanted to look.